A vertical wind tunnel is simply a machine that moves air vertically. These tunnels are often used for aerodynamic research, however the recent past has seen an explosion of tunnels being constructed for human flight. Wind tunnels that are built specifically for humans to fly in, are often referred to as skydiving simulators, indoor skydiving tunnels or simply wind tunnels. This article will cover the complete history of the people and machines involved with the development and growth of this modern activity. Since the end of the 19th century, horizontal wind tunnels have been used for aerodynamic research. Horizontal wind tunnels were inadequate in certain testing situations. Because of this, the first vertical wind tunnels were created to test aircraft spins, helicopter blades, and parachutes. 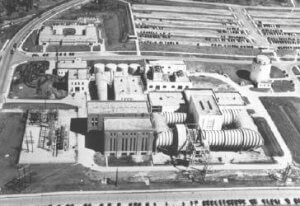 The first wind tunnel designed and built specifically for human flight began construction in Canada near Montreal in 1978. The machine was designed by inventor Jean St-Germain (4) and constructed by the now Aerodium Technologies. Jean St Germain originally built this machine so that his kids could experience freefall in a safe environment. (17) The tunnel featured a propeller below design. The air-stream was created by a DC-3 engine and prop which sat below the flyer under a steel reinforced net and cage. The flight chamber was built with the air column in the center and a padded surrounding area which kept flyers safe if they were to fall out of the column of air. Outdoor wind tunnels of a similar design often made appearances at skydiving dropzones. There were also wind tunnel scenes in both the 1994 movie Dropzone and the 2000 movie Cutaway. In early 1997 a patent was filed by SkyVenture (7) showing the first modern wall-to-wall wind tunnel design. The model is what has come to be referred to as an open-flow design. Instead of a single prop spinning below, the flight chamber pushing air upwards, multiple props with electric engines were placed above the chamber which pulled air up vertically through an enclosed flight chamber. A bell below the flight chamber causes the airspeed to increase in the flight chamber area. This design created a superior airflow since the turbulence created by the prop did not influence the airflow in the flight chamber. One downside to these models was the significant amount of noise they produced which could be heard from the outside. This model was also the first to implement a permanently enclosed flight chamber. This means that the air flow was present from wall-to-wall. With this type of design, it is not possible fly out of the column of air. This brought an interesting new set of rules and a different approach to safety. This design would be constructed and opened in 1999 as SkyVenture Orlando (now iFly Orlando) would be the first wind tunnel of its kind to open. Similar models manufactured by Sky Venture would then follow, opening in Malaysia, California, Spain, and Arizona. The disadvantage to these machines is the exposure to the outside elements. Because they pulled air directly from the outside environment, they lacked climate control. Up until wall-to-wall designs, the size of a flight chamber namely the diameter fell to the size of the prop and was not restricted by walls. With wall-to-wall designs like SkyVenture Orlando, there was now an increased importance on the diameter of the flight chamber since it would restrict the possible flight area. 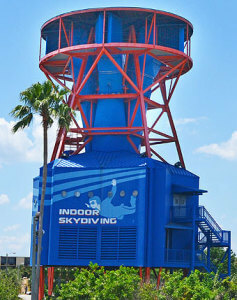 SkyVenture Orlando is a 12-foot octagonal design. 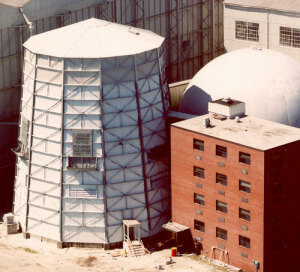 Aerokart was the first round 14-foot diameter wind tunnel opened in 2002. This was followed by SkyVenture Arizona which had a round 14-foot design as well. This 14 foot minimum diameter became a very important factor as most modern indoor skydiving sport disciplines require a tunnel of at least this size. It is also the minimum ideal size for skydiver training, especially when speaking of 4 way RW training - the most popular skydiving discipline. 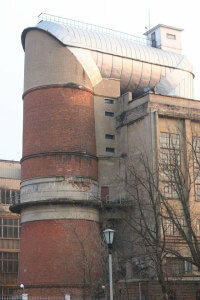 In 2005 Bodyflight Bedford in the United Kingdom became the first wall-to-wall wind tunnel with a 16' foot diameter. There are 17 foot diameter tunnels in the works with plans to be launched in 2015. What started at SkyVenture Orlando, soon saw skydivers beginning to flock to vertical wind tunnels as they were quickly able to learn the skills they required to become better skydivers. Freeflying - a type of skydiving where a skydiver falls in multiple orientations, including feet and head first - caused skydivers to fall at faster speeds. This meant that training this type of flying required faster wind tunnel speeds. With the increased reliance on the type of machine and the accessibility for skydivers, SkyVenture Arizona became the holy grail for skydivers and the example for the modern wind tunnel industry to follow. Built on the Skydive Arizona dropzone (skydiving facility) in Eloy, Arizona in 2005, SkyVenture Arizona offered the right size (14 foot, round) and enough wind speed (160 mph top speed) for skydivers to train all disciplines of flying, including freeflying. In 2004 a patent was filed by SkyVenture showing the designs for a new type of wind tunnel. (8) This tunnel used the same prop and electric engine style as an open flow model, but instead of simply pulling outside air through a flight chamber, the air was contained in a closed circuit recirculating design. This design would go on to be built first in the United Kingdom and called Airkix Milton Keynes. These recirculating tunnels offered a high quality wind flow without the exposure to the elements that previous tunnel models had. The downside to models like these, was that the heat of the motors and the recirculating wind caused the air temperatures in the flight chamber to rise to uncomfortable levels. In order to solve this problem, louver doors were added to the sides of the return air columns which allowed for outside air to be introduced which would cool the air temperature. Recent years have also shown the addition of air conditioning units added to wind tunnels to cool the air as an alternative to louver doors. The air conditioners allow for a precise climate control without the downside of the external noise or having to sacrifice the wind quality that louvers saw. The lower noise levels have allowed wind tunnels to be constructed in places with noise restrictions. With the introduction of the modern recirculating design, it now became possible to build wind tunnels in locations of all climates. With the introduction of the recirculating wind tunnel, SkyVenture took an early lead in the wind tunnel market and still to this day has the largest share. Mobile and semi permanent propeller below installations were introduced by companies like Aerodium Technologies. It wasn't until the mid 2000's when Indoor Skydiving Germany (ISG) came along and began building single sided recirculating units that SkyVenture had a competitive threat. In 2008 ISG built Indoor Skydiving Bottrop which became the centerpiece for the indoor skydiving revolution in Europe. 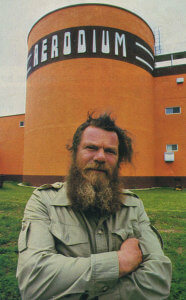 (10) In 2011 another recirculating tunnel was built by Strojirna Litvinov in Czech Replublic named Skydive Arena (now Hurricane Factory Prague). (11) In 2010 Aerodium built a recirculating wind tunnel for the Shanghai Expo which was later sold and is now the Dalian Flight Experience. In 2013 their first permanent recirculating design was constructed in Finland at Sirius Sport Resort. (17)(12) All of these companies continue to build wind tunnels all over Europe. Throughout this time period, there have been a wide range of tunnel in which were built on pre-existing architecture. 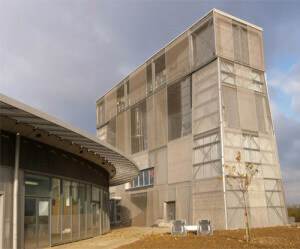 Take Bodyflight Bedford as an example which was built on the site of an old science research facility. While the skydiving mindset has been discussed, the real meat of the indoor skydiving industry is the entertainment or "first flight" industry. Most wind tunnel installations are aimed at locations which see a high volume of public traffic. Wind tunnels are now commonly seen near shopping and entertainment centers. These entertainment markets are the bread and butter for most wind tunnels. Events like family outings, birthday parties, dates, and even corporate events are a commonplace at wind tunnels. This is largely due to the wide range of ages allowed to fly. 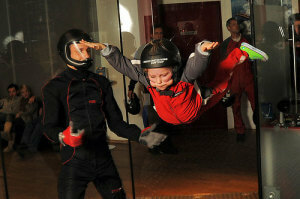 On average, anyone older than 3 years old in good physical shape is safe to fly in the wind tunnel. In previous years, skydivers traveled large distances to fly in the few wind tunnels available. In the recent past with wind tunnels starting to pop up so rapidly, skydivers have taken to tunnels closer to home, more convenient to travel to, or where prices are lowest. 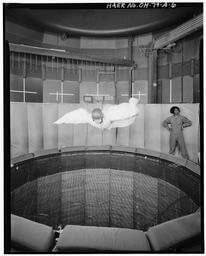 Skydivers played a large role in the development of the industry, but they are now a small percentage of the modern wind tunnel market. Some places, especially those close to skydiving centers or near major airports still cater to a larger percentage of skydivers. In addition to the skydiving market, a new breed of flyer is being born in the tunnel. Proflyers are tunnel hobbyists or professionals that choose to fly in the tunnel, but don't necessarily tie it to skydiving. With this concept we are seeing a new breed of young flyers who are coming and completely changing the game. Since the introduction of the first modern recirculating wind tunnel in 2005, wind tunnels have opened at an ever increasing rate. Since 2010 the indoor skydiving industry has exploded and the rate of construction reflects this. Some cities across the world are now seeing not only one, but two (or or even more) wind tunnels being built - namely Chicago and Houston. (15) In 2015 21 new wind tunnel opened their doors, the biggest year ever beating 2013's 11, and 2014's 14. We cover details of the industry each year, you can view the 2015 industry wrap-up infographic here. The end of 2015 also introduced a new breed of tunnel - the 17 ft diameter. Fly-in, the world's first 17 ft tunnel held the title of largest wind tunnel in the world when it opened in December. There are several of these models to open across Europe in the near future. These models are under construction by manufacturer Strojirna Litvinov. On one hand Europe has seen a variety in skydiving simulator construction to date with a handful of players building wind tunnels across the countries in Europe. This competition and the wide range of locations has caused a much wider variety of options available for wind tunnel fliers. Wind tunnels of modern technology in places like Russia, Poland, and Slovakia offer prices low enough to pull international traffic to these locations. Beginning in 2014 a glimpse of two new players appeared in the US market - both Airborne San Diego and Fliteshop set out to bring new wind tunnel technology to the United States in 2016. Since that time, Fliteshop who was planning to build Indoor Skydiving Germany model was stopped due to a legal battle between ISG and iFLY World. Airborne San Diego is currently on-track to open sometime in late 2016. (17) Tully, Shane. "ISS History Article." E-mail interview. 15 Jan. 2015.